#FinishThisFight! 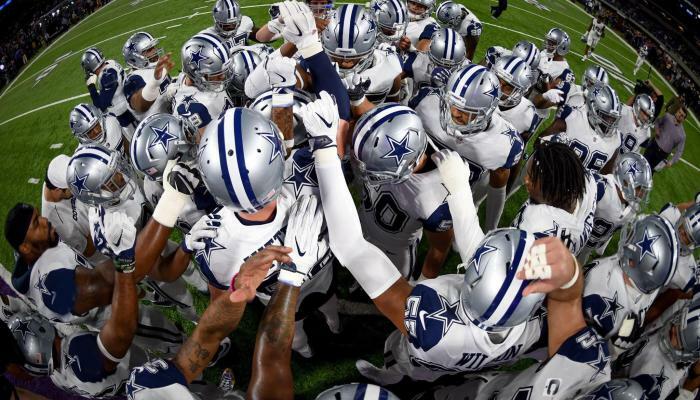 The legend of America’s team carries on this weekend when the number-one –seeded Cowboys take on the Packers on the Cowboys’ home turf at AT&T Stadium. This will be the second match for the two football titans this year, following Green Bay’s loss to Dallas earlier in the regular season. If you can’t get a ticket, make plans to watch at home or on your favorite barstool—the game will be nationally televised on FOX. Sunday at 3:40 p.m. Find an Arlington sports bar. Get AT&T tailgating tips. A number one rank and a return to the playoffs for our Boys call for some supersized pre-game partying, and that’s exactly what the gang at 1010 Collins has on tap at a shindig they’re billing as the “ultimate tailgate party” this weekend. Enjoy unlimited food and soft drinks, a full bar, live music, games, memorabilia displays, and special appearances by none other than Cowboys legends Drew Pearson, Charles Haley and Eugene Lockhart. Sunday at noon. True blue Cowboys fans can celebrate the Boys’ current Super Bowl run at Rally Day at AT&T Stadium, where you’ll meet and greet with Dallas Cowboys alums, shake some pom-poms with the Dallas Cowboys Cheerleaders, hit the field for a few games, and plenty more. Sounds like a blast! Saturday at 10 a.m.
One of the largest celebrations of the legacy of Dr. Martin Luther King happens right here in Arlington, where the festivities include a banquet at E.H. Hereford University Center, an essay contest, an art contest, and a “Day of Service” event involving hundreds of community volunteers. Friday-Monday. Find out more. International Bowl at AT&T Stadium. If you just can’t get enough of three-point field goals and touchdowns, you’re in luck—because the NFL playoffs aren’t the only football action to be had this long weekend! After you recover from cheering on the Boys on Sunday, head back to AT&T Stadium for the International Bowl, a series of eight games that showcase 500 top-performing high school and middle school football players from the United States, Canada, and Japan. Monday and Tuesday – see the ACVB blog for schedules and more info. No doubt about it, the UTA Planetarium is one of Arlington’s most out-of-this-world destinations for fun, fascination, and learning. Now showing: “Phantom Of The Universe,” “Pink Floyd,” “Big Bird’s Adventure,” “Astronaut,” and “Secrets of the Cardboard Rocket.” Warning: UTA Planetarium shows have been known to result in significant expansion of the mind. Friday through Sunday – see website for showtimes. And you thought he just did paintings. The current blockbuster show at the Arlington Museum of Art features a once-in-a-lifetime, fascinating exhibit of beautiful ceramic works by none other than the legendary Pablo Picasso. The show packs up in February, so make plans to visit soon. Friday and Saturday from 10 a.m. to 5 p.m.; Sunday from 1 to 5 p.m.
What’s better than a long weekend? A long weekend where you can watch three dudes in tights perform Shakespeare’s 37 plays in a hilarious 97-minute show, of course! Find out how they do it when Theatre Arlington premieres “The Complete Works of William Shakespeare (Abridged),” a fourth-wall-breaking, high energy parody that’s currently one of the theatre world’s most frequently-staged comedies. Friday and Saturday at 8 p.m.; Sunday at 2 p.m.